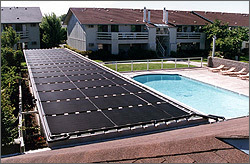 Solar Swimming Pool Heaters Add Extra Months To Swim Season! Solar swimming pool heaters use the pool’s water filtration system to pump water through the solar collector and the heat is then transferred directly to the pool water. When heating a residential pool with solar energy using a pool solar heater, you will need the solar collector to be 50%- 100% of the size of the pool. Usually these collectors are unglazed, meaning they do not have a glass cover on them. Sometimes these collector tubes are made of copper or copper and aluminum. These swimming pool solar heaters are for the most part maintenance free, and are designed with just one working part, which is a diverting valve. This valve controls the when the water circulates through the collector loop. When the water has reached a predetermined temperature that is hotter than the pool, the water is divereted from the filter system through the collector loop. When the water in the collector is about the same as the pool, the filtered water by passes the collector and is returned to the pool. The cost to buy and install a pool solar heater with an unglazed collector for most residential sized pools is between $3000--$4000, depending on the size of the collector you need and the type of system you choose. Pollution free, noise free, fuel free. So as you can see, solar pool heaters can add months of enjoyment for a small initial cost without any further maintenance or operating costs. Return from solar swimming pool heaters to solar heating.